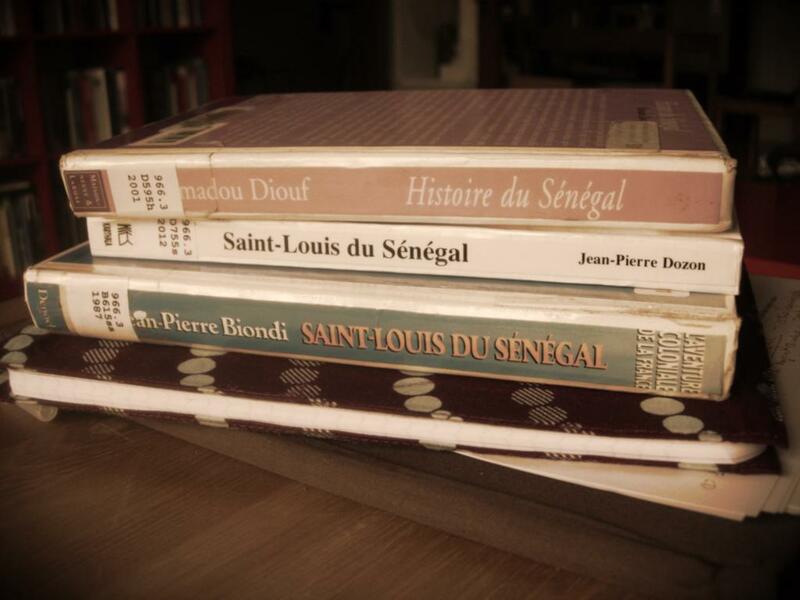 This week was largely devoted to brushing up on my Senegalese history. I’m revising an article – crossing my t’s and dotting my i’s (as well as changing most of my which’s to that’s…good lord did I not go to middle school?) and I realized that while the literary premises were sound, the paper was really lacking context. (And by “I realized” I mean “my adviser – the fiercest editor I’ve ever met – suggested that I needed to put all the literary pish-posh into some kind of cohesive historical framework”…) So I went about kicking myself for the thousandth time since I began working on my ‘dissertation project’ proper for having wasted my intellectual youth coming up with clever ideas instead of cracking open a dang history book, and then I hit the library. I found a few sources that were particularly good. I FINALLY got around to reading Mamadou Diouf’s L’Histoire du Sénégal: le modèle islamo-wolof et ses péripheries (2001) which is, of course, a fantastic source. Diouf is the dude, as far as I can tell. The dude who knows the stuff. The most helpful part of this book for me, since I am working on cities, was the brief section related to the establishment of the Quatre Communes in 1848. It’s really important for Diouf to concentrate on this because a big part of his project is looking at the center/periphery model. I think we’re quite accustomed to thinking of colonized spaces in Subsaharan Africa as métropole/vast washes of undeveloped space with a trading post or two. In significant ways, however, Saint-Louis in particular, and the other three cities of the Quatre Communes (Dakar, Rufisque, Gorée) will be as important, if not more, than Paris (or Nantes or Bordeaux). Not forever, but certainly in the 19th century. So, in case you were curious, the Quatre Communes were the major four cities in Senegal during the 19th century, the majorest one being Saint-Louis (not Dakar, as you might think). According to Diouf, a distinct population is developing here that is removed from both the ‘traditions autochtones sénégambiennes’ as well as the dictates of the ‘mission civilatrice’ (135). These four cities are inhabited by “originaires’ – people who inhabited these spaces before France, mostly comprised of an Islamo-Wolof population, as well as French colonists and traders. The demographics are the French, the increasingly powerful population of mulâtres that I will talk more about, freed slaves and servants. Here’s the thing, everyone living in these cities falls under the category of French citizen, while everyone in the intérieur is going to fall into the category of French subject. This is important. These originaires are going to be the roots of the future class of évolués who will take over power from the French after independence in 1960. These places are pretty well urbanized. I would argue that, if you think real hard about what French cities looked like in the 19th century, they are probably not too far off from a Saint-Louis. Remember, France is in the middle of various bloody revolutions that distract from the building of proper infrastructure. There are no sidewalks or plumbing. Live chickens are being sold at the market. People are rampantly dying from disease. The Industrial Revolution is only just beginning. We’re not exactly in “tradition vs. modernity” here yet. Time has not split. Right now I’m still going through Jean-Pierre Biondi’s Saint-Louis du Sénégal: mémoires d’un métissage (1987) and I’m not sure how sound it is academically (there are no citations…is this something historians get away with that I don’t know about? y’all are a rebellious bunch), but I’m intrigued by the premise that the singular aspect that made this town thrive was its ability to adapt in the form of métissage. Off the top of my head, I’m not totally sure how people are translating this term, so I’m going to leave it in the French because it gets real tricky real fast in the English. Most importantly, this book discusses the rise and fall of a powerful class of mulâtres (again, untranslatable) who essentially controlled the town. Not French traders, not African warlords, but in point of fact, it was mostly the children of white French traders and their Wolof concubines who ran the town until the arrival of Faidherbe in the 1850’s. This is mainly due to the legal status that they were, in fact, granted. It was perfectly acceptable for French traders/settlers to “marry” a local gal and, upon leaving, to give her a fair amount of the profit/property accrued during his stay in Saint-Louis, which would then pass on to any children. (Which is still not exactly just compensation for, you know, forced concubinage but that’s not really at issue right here right now…) This isn’t far off from the situation of the legendary ‘octoroon’ character of New Orleans (à la George Cable) except that these signares would become exceedingly influential due to their accruing of funds and then their participation in local trade. I’ve mentioned that this had to do with their right to seize their French ‘husband’s’ property when he made his merry way back to France, and the right of their children to inherit, but what is the status of these relationships? In fact, because it was seen by the French to be absolutely detrimental and impossible for men to have their delicate French wives tagging along to the colonies with them, these ‘marriages à la mode du pays‘ – concubinage – were entirely (by law, probably not my the fledgling Saint-Louisian Catholic Church and less so by any of the Muslim/Wolof population) accepted. Biondi also puts some emphasis on the fact that these ‘marriages’ were made not between French citizens and, say, daughters of the local (African) ruling class, but rather between French citizens and female slaves. What this indicates is that for these signares, throughout several generations, you have a powerful class of women emerging out of a position of complete subjection. This IS NOT to romanticize the situation. What is important is that this particular space, Saint-Louis, seemed outside of any hierarchical dualisms that were guiding, well, the rest of the world, in this one specific case. It is not ideal, and this class of métissage is not to be commended or condemned. They were slave-holding and exploitative individuals to the same extent the French were. It’s more a representation of this crazy anything-goes urban space of Saint Louis in the late 18th and early 19th centuries. All right, this final book, Jean-Pierre Dozon’s Saint-Louis du Sénégal : palimpseste d’une ville (2012) I can’t spend that much time on here (remember when I said that I was working on an article? Yeah, that’s still happening…) but out of these three texts, it absolutely has the most interesting premise. In his intro, Dozon calls Saint-Louis a kind of “hyperville” and by this he means a place of extraordinary qualities – emPHAsis on EXTRAordinary – in the same sense we would say EXTRAterrestrial. He gets there by mentioning the very buzz-word-y ‘lieu de mémoire’ – a concept developed by Pierre Nora and others which essentially implies that objects/places have overlapping layers of meaning, developed throughout time, that become a charged space where memory continues to live. EmPHAsis on presentness instead of pastness of memory, right? For Dozon, the whole of Saint-Louis would best be examined as a space of overlapping temporalities, overlapping collective memories, overlapping populations, traditions, religions, artistic practices, economic systems, political infrastructures, etc etc etc… This renders it a space that is not France and not Africa and certainly not just a ‘hybrid’ combination of both but something truly à part. I like this. I think it’s groovy. 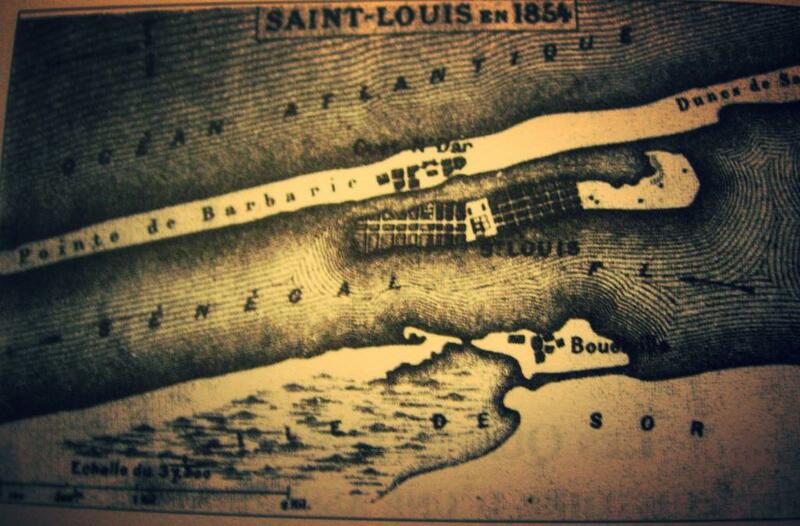 And if you ever actually go to Saint-Louis this is EXACTLY what it feels like. You are truly in a different time and I do not mean that in the study abroad, urban safari, “Africa is so ‘traditional'” sense. Where you are is both no-where and now-here, and you have a hard time figuring out whose historical trajectory you’re standing in the middle of. 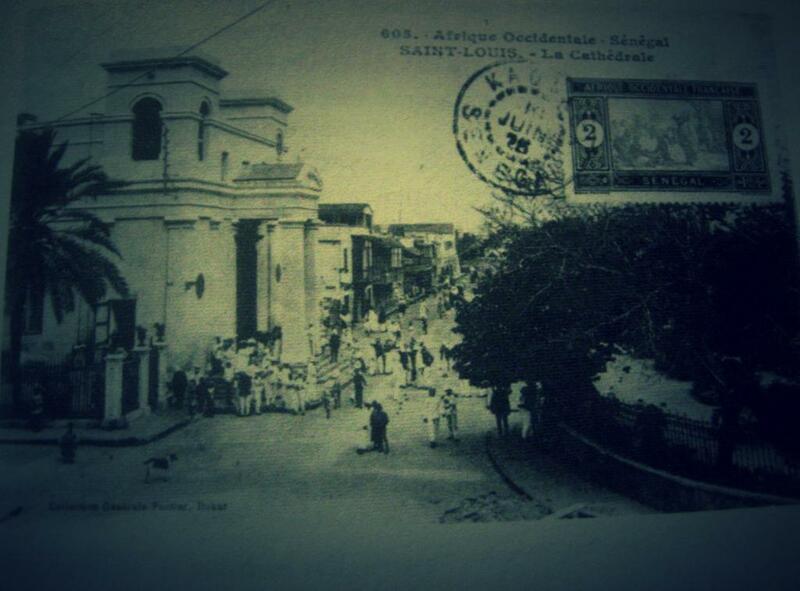 People will tell you – it’s Saint-Louis’s.